We all need a little motivational inspiration once in awhile. Thanks, Teagan, for yours. I gave myself a rule to restrict “Teagan’s Books” to writing and indie publishing related topics. However, with a previous director at work, one of my tasks waswriting a motivational message every week. During the past few days one of those messages has repeatedly come to mind. Maybe, I said to myself, someone needs to hear it. So I’m making an exception to my rule. For me, the past eighteen years has been a constant exercise in improving my situation in life. That has forced me to be constantly ready to tackle obstacles that are all but insurmountable for one person; alone. 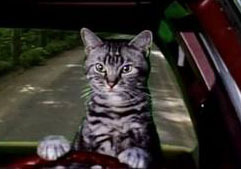 I mean things like driving all the way across the country with only my two cats for moral support — cats who, unlike Toonces in the old Saturday Night Live shows, cannot help with the driving! But I digress. Here is that message. You’re welcome, Mary. I’m flattered that you enjoyed “Facing Fear” enough to share it with others.